We take pride in the fact that we make our premium water distillers right here in Lincoln, Nebraska. We make our products in the same building that our sales and administration employees work. The people who put our machines together have been with us for an average of seven years. We each talk every day, we’re friends. The people who produce our products are truly craftsmen (and craftswomen). We put tender love and care into each machine, and if there’s a problem we all get involved. Does it matter to you that our premium water distillers are made with TLC in the USA? Does it matter? You bet it does! It matters to me and millions of other citizens of the USA who still believe it’s OK (and even preferred) to be exceptional. Having National pride is not arrogance, it’s a sign of strength and progress. The better we are and the more we produce… the more families we can help. Thanks Kevin. We think it’s better to produce in the USA for many different reasons, not the least of which is ensuring a better product. We have intimate control over what we do. We know the people on the line. We TRUST the people on the line. We are in control of all aspects of our process. We are able to be the best we can be! They are put together in the USA but where do the parts come from? Thanks for your comment Ashley. Unlike a huge number of manufacturers in the US that have outsourced their production overseas, we have never done this over the past 40 years. Outsourcing to China would have been the easy way to go, but we didn’t want to give up control of our quality and we fundamentally believe that we should manufacture here. We can’t guarantee that all of the components that go into our products have been made in the US, because there are parts that just aren’t made in the US anymore, by anyone. We source the best components that we can, and we try to get US made parts if possible. The vast majority of our components, including the stainless steel, areof US origin. What percentage of components are outsourced and where from? Thanks for your question. 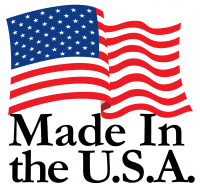 In order to carry the Made in America tag, we have to be over 80% American made. If a part cannot be obtained in the U.S. we do extensive testing to make sure the part lives up to our high standards. That’s why every part is covered by our full warranty. I am glad to see that the stainless steel used in your product is manufactured in the USA. What grade stainless steel is used in the water compartment which holds the water being distilled? We use 304 grade stainless steel made locally here in Lincoln Nebraska.